This management agreement form is designed to document the management of a doctor group practicing medicine which is managed by a medical practice management firm. This agreement would be suitable for a doctor manager relationship for any medical specialty. 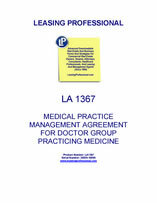 The agreement specifies the authority and responsibilties of the practice manager for the administration and business management of the medical practice, which include arranging for equipment, supplies, non-physician personnel pursuant to specified standards, provision of office space, financial record keeping, and patient billing and collection, among other duties. The practice of medicine is left to the physician group under the agreement. This Business Operations and Support Services Agreement (this “Agreement”) is made and entered into this ___ day of _________, 20___, effective as of _______________, 20__ (“Effective Date”), by and between Medical Practice Management, a ___________ corporation (“Practice Manager”), and Medical Associates of __________, P.C., a __________ professional services corporation (“Medical Practice”) located at ________________, __________. The foregoing recitals are true and correct and are made an integral part of this Agreement as though fully set forth and incorporated herein. For the purposes of this Agreement, the following terms have the following meanings, unless otherwise clearly required by the context in which the term is used. 2.1 Agreement. The term “Agreement” means this Medical Practice Management Agreement between Medical Practice and Practice Manager and any amendments that may be adopted from time to time as hereinafter provided. 2.2 Budget. The term “Budget” means an operating budget for each fiscal year as prepared by Practice Manager. 2.3 Confidential Information. The term “Confidential Information” means all of the materials, information and ideas of Practice Manager, including, without limitation: operation methods and information, accounting and financial information, marketing and pricing information and materials, internal publications and memoranda, and other matters considered confidential by Practice Manager. 2.4 Management Fee. The term “Management Fee” means Practice Manager’s monthly compensation established pursuant to this Agreement, against receivables draw. 2.5 Practice Manager. The term “Practice Manager” means Medical Practice Management, a ___________ corporation, and any successors or assigns. 2.6 Practice Manager Expense. The term “Practice Manager Expense” means an expense or cost incurred by Practice Manager and for which Practice Manager is financially liable. 2.7 Managing Physician. The term “Managing Physician” means that physician designated by Practice Manager to direct the delivery of clinical services to patients by Practice Manager. 2.8 Medical Practice. The term “Medical Practice” means Medical Associates of __________, P.C., a __________ professional services corporation, and any successors, assigns, subsidiaries or affiliates. 2.9 Medical Practice Account. The term “Medical Practice Account” means the bank account of Medical Practice. 2.10 Medical Practice Expense. The term “Medical Practice Expense” means an expense or cost that is incurred by Practice Manager or Medical Practice and for which Medical Practice is financially liable. 2.11 Medical Services. The term “Medical Services” means medical care and services, including but not limited to the practice of medicine, and all related health care services provided by Medical Practice through Medical Practice’s Managing Physician and Physician(s) that are retained by or professionally affiliated with Medical Practice. 2.12 Office. The term “Office” means any office space that Practice Manager or Medical Practice owns, leases or otherwise procures as an agent for Medical Practice for Medical Practice for the purpose of providing Medical Services. 2.13 Physician. The term “Physician” means the individually licensed professionals who are shareholders of Medical Practice, or are employed or otherwise retained by or associated with Medical Practice by contract. 2.14 Professional Personnel. The term “Professional Personnel” means any licensed personnel, other than Physician(s), whose clinical services are provided under the direction of Physician and are retained by or professionally affiliated with Medical Practice. 2.15 State. The term “State” means the State of __________. 2.16 Term. The term “Term” means the initial and any renewal periods of duration of this Agreement as described in Section 8.1 hereof. 2.17 Effective Date. The Effective Date shall be ___________________ unless mutually agreed upon by both parties. III. Business of Medical Practice and Practice Manager. The parties stipulate that the business of the Medical Practice and Practice Manager are those Medical Services, and Practice Manager services in support of Medical Service (i) where both the “facility” and “professional” components of the Medical Services have historically been provided in the Medical Practice’s private practice offices and reimbursed on a “global basis,” and (ii) where the “professional” component of the service has historically been provided in a hospital inpatient or outpatient facility, nursing home, ambulatory surgery facility or some other licensed or certified “facility” eligible for separate reimbursement for the “facility” component of such service and where the “professional” and “facility” components of the service are billed separately by different legal entities.